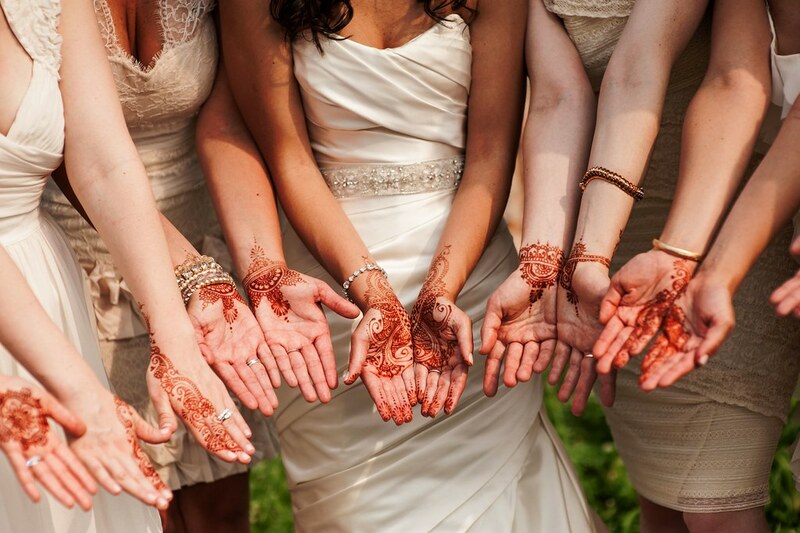 Book a Henna Party Now! Delight your guests with the henna body art experience. A wonderful addition to any gathering: sangeets, mehndi parties, bridal showers, engagement parties, baby showers, bat and bar mitzvahs, birthday parties, book club meetings, fundraisers, Tuesdays, or just hanging out with friends. For large parties it's recommend that you hire more artists; please contact me to discuss. Travel fees apply for certain areas; please ask if your area is exempt. A unique addition to your next event, I can teach a short henna class to your guests before giving everyone their own henna design. Topics can be any or all of the following: how to make henna, how to draw with henna, bridal traditions in India and Morocco, design, and history. Once the henna paste is applied it needs about a half hour to dry, but needs to stay on for a total of 6-12 hours (hands and feet need 6 hours, the rest of the body 8-12 hours). After the waiting time has passed you scrape off the dried paste and you must keep water off the hennaed skin for another 6-12 hours for the stain to fully take on your skin. Upon removal of the paste you will see a bright orange stain which will gradually darken over the next 24-48 hours, turning a deep, rich reddish brown color. The stain can last anywhere from 1-3 weeks; it will last longer on the palms of your hands and your feet because the skin is thicker. The stain fades gradually as your skin exfoliates; if you want the stain to last avoid using anything on the skin that will exfoliate it and use gloves when doing dishes or housework...or better yet, use your henna as an excuse to avoid cleaning!